It's Garry Shandling's Show is an American sitcom that was initially broadcast on Showtime from 1986 to 1990. It was created by Garry Shandling and Alan Zweibel. The series is notable for breaking the fourth wall. The 30-minute series stars Garry Shandling as, more or less, himself: A neurotic, somewhat self-obsessed stand-up comedian who just happens to be aware he is a television sitcom character. Garry spends just as much time interacting with the studio audience as he does the regular cast members, offering up opening monologues and show-closing summations of the episode's events (much like George Burns on The George Burns and Gracie Allen Show). However, on Garry's show, all the supporting characters know they are on a TV show, not just Garry; and the studio audience is often in the storyline. At the time of the series' production, Shandling actually lived in Sherman Oaks, California, just like the character on the series. His condominium on the series was styled to be just like his real-life condo, down to the room layout and the furnishings. Storylines were often manipulated by Shandling to create more favorable outcomes or simply to speed things along. One episode ended years later, for example. Another allowed Shandling to tell the audience that time had passed in order to console an angry neighbor whose wall he had damaged; by the time the scene transitioned, the workmen had already fixed the wall. On America's presidential election night in 1988, Showtime presented a live episode wherein Shandling brought in Soul Train host Don Cornelius to incorrectly announce that Michael Dukakis had soundly defeated George H. W. Bush. The series' theme song is "This Is the Theme to Garry's Show", sung by Los Angeles musician Bill Lynch. The song's lyrics are self-referential, explaining how the song came to be ("Garry called me up and asked if I would write his theme song") and asking what the listener thinks of it. Considered a critical and niche success, It's Garry Shandling's Show ran 72 episodes and was on the air for four seasons (1986–1990). The show was later picked up by the broadcast Fox network from 1988 to 1990 as part of its Sunday night lineup with minor cuts for language and advertising breaks; Fox began airing the show from the beginning, but due to longer seasons for network shows versus cable, had caught up by the time the show left Fox in March 1990. New episodes continued for a few months thereafter on Showtime. The show introduced much of the country to Shandling and paved the way for his run as Larry Sanders on HBO's The Larry Sanders Show. Throughout the series, the cast was divided into the "Starring" cast, whose names were featured in the opening credits; the "Co-Starring" cast and the "Guest Starring" cast, both of which had the actors' names featured in the end credits. Garry Shandling as Garry Shandling - Immature star / host of the show. Constantly obsessed with his hair. Geoffrey Blake as Lewis (early season 1) - Garry's ladies' man best friend. Dropped from the series after the first run of six episodes. Molly Cheek as Nancy Bancroft - Garry's "attractive, but non-threatening, platonic neighbor." Jessica Harper as Phoebe Bass (season 4) - Garry's girlfriend and eventual wife. Scott Nemes as Grant Schumaker - Garry's neighbor, son of Pete and Jackie Schumaker. Michael Tucci as Pete Schumaker - Garry's close friend and neighbor. Father of Grant and husband of Jackie. Very nerdy and clumsy. Leads his son's Cub Scout troop. Bernadette Birkett as Jackie Schumaker (mid-season 1 through season 4, recurring guest early season 1) - Garry's neighbor, Pete's wife and Grant's mother. Ian Buchanan as Ian McFyfer (mid-season 3 through season 4, recurring guest early season 3) - Nancy's boyfriend and eventual husband. Barbara Cason as Ruth Shandling (seasons 2-4, recurring guest season 1) - Garry's mother. Paul Willson as Leonard Smith (mid-season 1 through season 4, recurring guest early season 1) - The president of the condo association that Garry lives in, who frequently drops by uninvited so that he can end up on-camera on Garry's show. He is a nuisance to Garry and his friends. Bruno Kirby as Brad Brillnick (seasons 3-4) - Garry's agent. Richard Fancy as Mr. Stravely (seasons 3-4) - Network boss. Danny Dayton as Mr. Peck (seasons 2-3) - Comedy club owner. While fighting ovarian cancer, Gilda Radner guest-starred as herself in the series in 1988 in what would be her final television appearance. When Shandling asked her why she had not been seen on television for a while, Radner replied, "Oh, I had cancer. What did you have?" In the United States, the series aired on Showtime: The first season aired on Wednesdays and the rest of the series aired on Sundays. It was originally picked up for 6 episodes. After the success of them, Showtime ordered 12 more (although only 10 were produced). 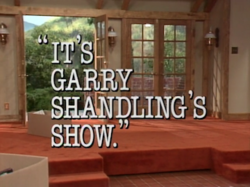 To bolster its Sunday night lineup, Fox secured the rights to air reruns of It's Garry's Shandling's Show not long after they aired on Showtime. The reruns aired Sundays on Fox at 9:00–9:30 from March 1988 to July 1989, at 9:30–10:00 in July 1989, at 10:00–10:30 from July to August 1989, and at 10:30–11:00 from August 1989 to March 1990. The series was aired in the United Kingdom on BBC Two from 1987 to 1990. The series was nominated for four Primetime Emmy Awards. It won five CableACE Awards (three for Best Comedy Series and two for Garry Shandling). It won an American Comedy Award for Funniest Male Performance in a Comedy Series-Cable or Syndicated, and an award for Outstanding Achievement in Comedy in 1988 from the Television Critics Association. On October 20, 2009, Shout! Factory released It's Garry Shandling's Show: The Complete Series on DVD in Region 1. The 16-disc set features extensive bonus features including featurettes, commentaries and outtakes. Time praised the set's release, writing "As self-referential comedies went, you never meta better one," while Entertainment Weekly named it one of the best TV on DVD releases of 2009. The first season of the series was released as a standalone title in America in April 2010. In Region 2, Fabulous Films has released the first two seasons on DVD in the UK. In Region 4, Shock Entertainment has released all 4 seasons on DVD in Australia. ^ DVD commentary from It's Garry Shandling's Show, Season 3, Episode 46, "Garry Acts Like A Moron"
^ Niccum, Jon (May 4, 2007). "Midwest icon Bill Lynch discovers how to 'live the music'". Lawrence Journal-World. Retrieved March 25, 2016. ^ "Encyclopedia of Television - It's Garry Shandling's Show/The Larry Sanders Show". The Museum of Broadcast Communications. 2013. Retrieved March 25, 2016. ^ Brooks, Tim (2007). The Complete Directory to Prime Time Network and Cable TV Shows: 1946-Present (Ninth Edition). Ballantine Books. p. 678. ISBN 978-0-345-49773-4. ^ "It's Garry Shandling's Show DVD news: Press Release for It's Garry Shandling's Show - The Complete Series". TVShowsOnDVD.com. Archived from the original on March 3, 2016. Retrieved March 25, 2016. ^ "Short List". Time, October 26, 2009, p. 63. ^ "The best TV on DVD of 2009". Entertainment Weekly. December 18, 2009. Retrieved March 25, 2016. ^ "It's Garry Shandling's Show DVD news: Announcement for It's Garry Shandling's Show - The Complete 1st Season". TVShowsOnDVD.com. Archived from the original on March 3, 2016. Retrieved March 25, 2016. ^ "It's Garry Shandlings Show Season 1". Fabulous Films. Retrieved March 25, 2016. ^ "It's Garry Shandlings Show Season 2". Fabulous Films. Retrieved March 25, 2016.